Researchers at Brigham and Women’s Hospital in Boston compared people who read on an iPad screen before bed to those reading a traditional paper book before bed. The study confirmed what has long been suspected: that exposure to a screen decreases sleep quality, shortens the amount of REM sleep, and leads to worse moods and poor productivity the next day. Ideally, you should avoid all light-emitting screens for at least an hour before bedtime. The main problem seems to be with the blue wavelengths of light, that suppress our body’s natural melatonin production. If you really have to read a screen late in the evening, use a physical filter that blocks bluelight, or use free software such as f.lux that achieves the same effect. For Android users, there are several apps available, such as Twilight. 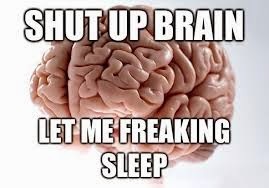 Another problem associated with difficulty sleeping is the presence of intrusive or repetitive thoughts. Interestingly, researchers at Binghamton University have discovered that one of the best way through to cease anxious thoughts is actually to get to bed earlier. Staying up late at night and having a short duration of sleep just aggravate the problem. It can be a challenge to adjust your habits to get to bed earlier, but it’s worthwhile. Maybe you could stop watching those electronic screens late in the evening. If repetitive thoughts are actually preventing you from falling asleep, you could try and herbal sleep aid such as valerian root, or a do-it-yourself behavior modification programs such as SleepStar. When you sign up for SleepStar, use code PetersND25 for a discount.